Have you always considered native files as the nearest possible thing to the iFile tweak in the iOS 11? If yes, then you are highly mistaken as this application is very different from the Files app as it allows you to browse a limited amount of files on your device. Read on to learn how you can download FilzaJailed app on your iPhone, iPad or iPod Touch running iOS 11.3.1, 11.3, 11.2.1, 11.2, 11.1 or iOS 10. 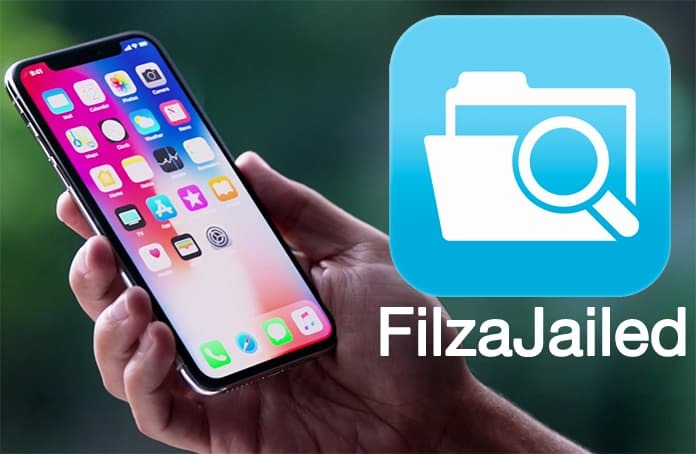 FilzaJailed solves the very basic problem of browsing root file system without the need of jailbreak. Lately, in a demonstration, it was showcased barebones file on an iPhone X which was running on the iOS 11.1.1. The mechanism of this application is simple, it occupies async_wake exploit which is based on Ian Beer’s iOS 11 kernel exploit. FilzaJailed application combines together async_wake exploit and the FilzaJailed app and ports it to the iOS 11. However, it should be noted that the original application works only with iOS 10 and does not have a port for iOS 11. The original application is compatible only with iOS 10 jailbreak and doesn’t have a port for iOS 11. As per the developer’s opinion, this application may not work for all 64- bit devices that are running on iOS 11.1, 11.1.1 or 11.1.2, but it is still worth giving a try. The only negative thing that can occur is that the application will crash at the beginning. Even though Ian Beer’s exploit runs smoothly on iOS 11 till 11.1.2, FilzaJailed works with these only majorly because it uses async_wake. You can navigate to our downloads section page to download FilzaJailed IPA file and install it on your device. Step 2: Download the IPA file from the link mentioned above to your desktop. 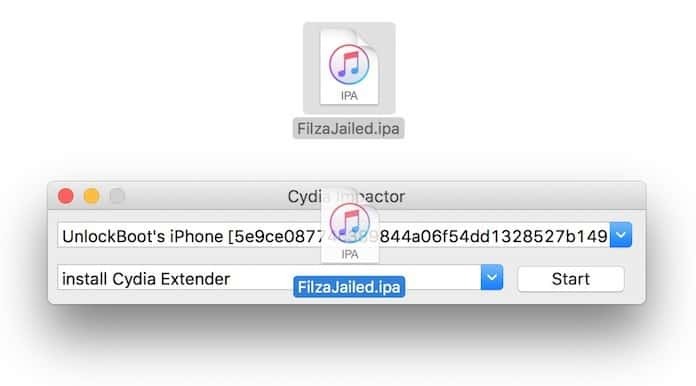 Step 3: Drag the FilzaJailed IPA file onto Cydia Impactor’s window. 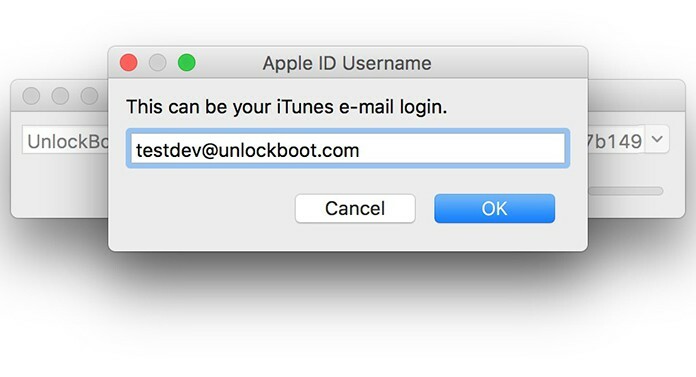 Step 4: Put in your Apple ID credentials and let it authenticate those details with Apple’s servers. Step 5: Once the installation process ends, disconnect your device from your computer. Step 6: After the installation, you will need to trust the application first. This can be done in the following way: Go to Settings app > General > Device Management. 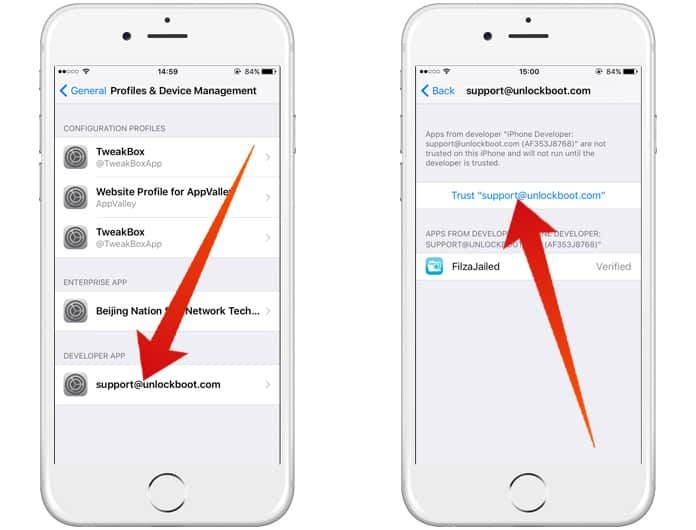 Look for your Apple email address and tap Trust. Step 7: Now you can go to your home screen and run the FilzaJailed app. Alternatively, you can use TweakBox to install the FilzaJailed app without Computer. You can follow our dedicated tutorial on how to install TweakBox app on your iPhone running iOS 11 or iOS 10 in this article here. It is as simple as this, once done with all the steps, just return to your home screen and open the FilzaJailed app. As the name suggests, this app is a tweak called Filza on Cydia. This tweak will be visible in the interface too. 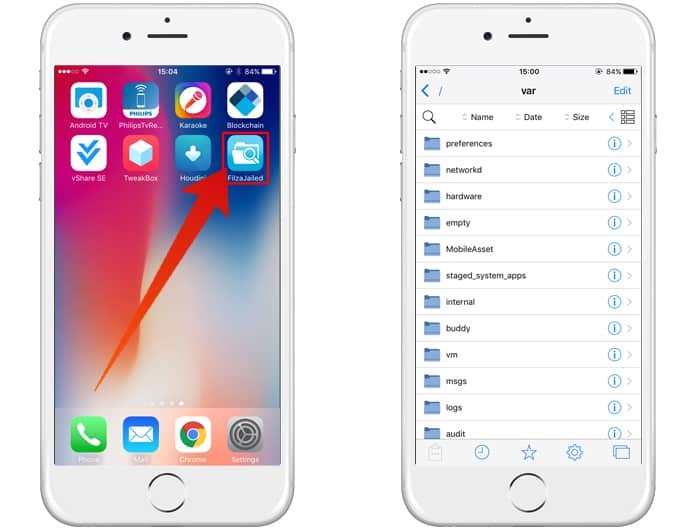 Once the process is complete, you will now be able to browse the root file system of iOS with full permissions, additionally, you can also edit any text-based file too.